The big news of the past week for lovers of snowsports is, undoubtedly, the huge snowfalls in the Alps and the Dolomites at the end of last week. One Italian ski area claimed to receive over 2 metres of snow in 72 hours; the most in the country this season. Plus several in Austria, Italy, France and Switzerland posted 1 metre accumulations, respectively, on their upper slopes within a 24 hour period last Thursday or Friday. 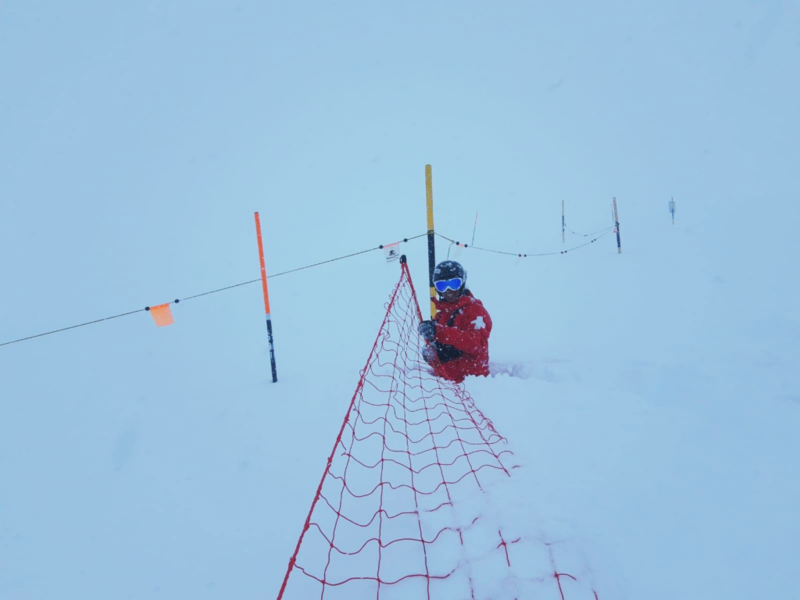 Engelberg (80/730cm), previously one of only two ski areas claiming a base of more than 6 metres on it’s upper runs, became the first to post a total of over 7 metres this year. The ski area received a metre of snow up on its Titlis glacier. That took it to 7.3 metres or around 24 feet. In most areas the snow fell down to valley level rejuvenating what had become thin cover or even no snow remaining at some resorts; making for a great weekend of top-to-bottom powder skiing. The Dolomites, which have not had a particularly snowy winter, had some resorts receive as much snow over 24 hours as they had during the previous three months. Against all the powder joy of this snowy excess, some areas had to close or severely limit open terrain, initially, as access was cleared, lifts dug out and pistes made avalanche safe. The avalanche danger level went up to 3 (considerable) or 4 (high) in many areas, particularly above 2000m. Although it has eased somewhat it most areas since the weekend. The snow has continued to fall for the start of this week with most resorts seeing a mixture of snowy periods, foggy or cloudy periods and sunshine. It wasn’t just the Alps and Dolomites that got the snow either although they got by far the most. The Pyrenees has had a snowy week and there has been snow down to Europe’s most southerly major ski area: Sierra Nevada (40/180cm), in Spain; even at the most westerly one: Serra de Estrella (10/50cm) in Portugal. The latter now hopes to be open to Easter. There was also more snow for Scandinavia and in Scotland. Several closed ski areas re-opened after 50cm falls at the end of last week. North America has had a quieter week although with some small to moderate falls, particularly in the west. In spite of all the fresh snow the inevitable march of time continues and another swathe of resorts closed for the season on Sunday. Included was some of the bigger, better-known areas like Jackson Hole and more will be closing this coming weekend too, although plenty more will stick it out at least to the Easter weekend. After a snowy end to last week, Austrian ski areas have had a drier, warmer start to this week. A swathe of Austrian ski areas extended their season on Sunday. Traditionally, more Austrian areas tend to close earlier in April than the resorts in France, Italy and Switzerland. With Easter so late this year, there’s no intention to hold out another fortnight. On the other hand, Austria is home to more glacier ski areas than any other country (eight), most of which will be staying open to May, June, July or even longer. The snowfall last week helped bolster snow depths. Therefore, however hot the sun this summer, the snow will hopefully last a good while. Solden (218/503cm) and the Dachstein Glacier (540/540cm) have the country’s deepest bases, Solden going above the 5m mark for the first time this season this week with the new snow. But the other 6 glacier areas all have at least 3.3m (11ft) of snow. There were moderate to huge snowfalls in France to end last week too. This weather transformed slope conditions after weeks of sunny, spring weather. The snowfall has eased off a little in some places but kept dumping down in others, particularly on Sunday, bringing still bigger accumulations as we move towards mid-April. Some of the biggest reported 24-hour snowfalls included a metre on upper slopes at Serre Chevalier (35/300cm) and 70cm at La Grave (90/170cm). Previous thawing had taken the upper slope base depth down below 3 metres in France but by the weekend a dozen areas reported their bases had gone back above that magic 10 foot mark, led by Avoriaz (180/340cm). Valley depths, sometimes more important at this time of year, were also boosted with Chamonix (25/290cm) climbing up from zero to 25cm. It is still snowing in France and La Plagne (120/225cm) posted 14cm of fresh snow on Monday; Chamonix too got another 10cm. La Clusaz announced they were opening the lifts early on the 6th April (7.30am) so that people could enjoy all the fresh snow as soon as it was light. 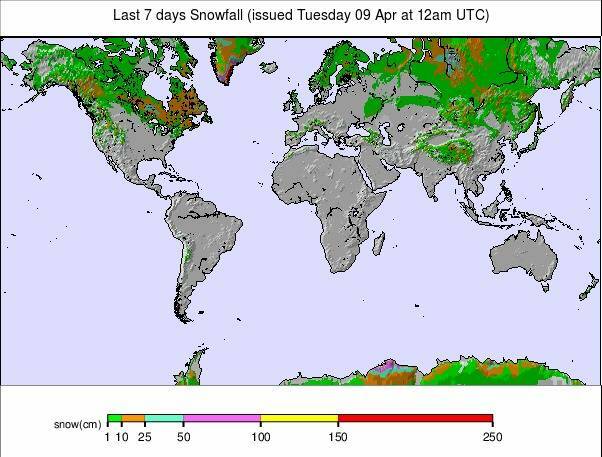 Switzerland had the world’s deepest snow packs a week ago and that has not changed in the last 7 days. It just got a lot deeper with Engelberg (80/730cm), as mentioned in our introduction, becoming the first in the world this year, and this ski season, to pass the 7 metre snow depth mark. The 80cms it received down at its base was probably more welcome than the extra up top though. The pack had got very thin (15cm/6″) before the snow arrived but now top-to-bottom skiing should continue for much longer over its 2,000 metres of lift-served vertical. Engelberg is open right through to the last weekend in May. 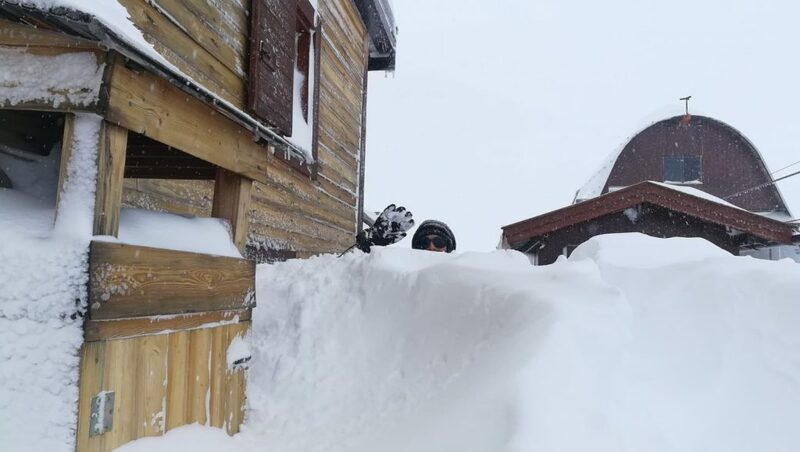 It’s a similar story across the country and as with the other Alpine nations, a number of resorts have had more than a metre of snow in the past week. Included is Andermatt (60/600cm), another of those with a very deep base that’s open into May. 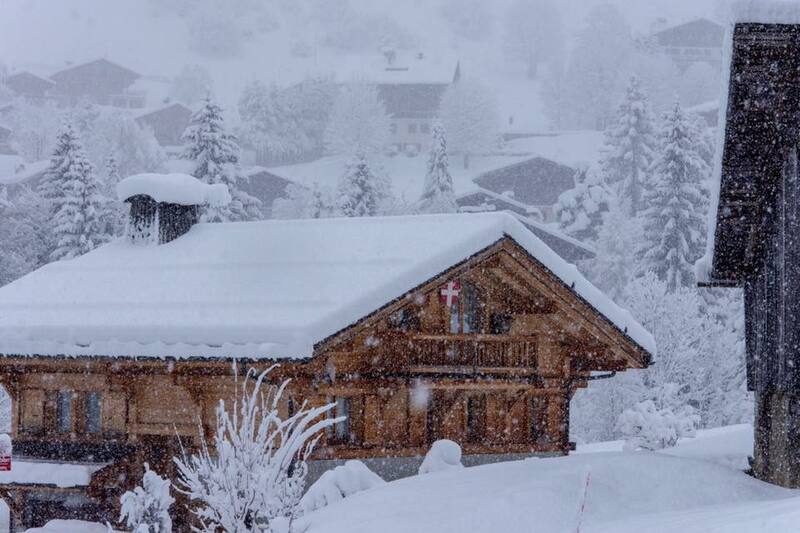 More snow has been falling in Switzerland at the start of this week with Swiss areas reporting up to 10cm of fresh on Monday. This has come with a cost though: low cloud and fog on the ski slopes at times. Italy has seen some of the biggest snowfalls in Europe over the past week with the little known resort of San Domenico di Varzo (40/400cm), in the country’s western Piemont region, claiming it received over 2m (306cm/almost 7ft) of snowfall in 72 hours to Friday; the most in the world this week. Another ski area, Chiesa Valmalenco (35/180cm) in Lombardy, further east reported it had had 185cm (over 6ft of snow) in the same period. The snowfall was perhaps most marked in the Dolomites, however, where a number of regions reported a metre of snow in 24 hours at the end of last week. In many cases more snow than they had received in total over the past three months since the new year. All in all, the Italian snowfalls were the biggest for about six months, since huge pre-season snowfalls (with associated sometimes damaging storms in some areas) kick-started the Italian 2018-19 ski season last October. have also had more than a metre in a few days; by far the biggest snowfall of the season. In fact, in some cases almost as much as they’d had all season. This is 2626m up in the Val di Fassa at the Rifugio Pian dei Fiaccon. Andorra and the Pyrenees have had unsettled weather for more than a week now bringing light to moderate snowfall day after day and giving the slopes a general freshen up with even some late-season off-piste powder to enjoy at times. The new snow has had a mixed impact on base numbers; Grandvalira (40/110cm), the region’s largest ski area incorporating both Pas de la Casa and Soldeu’s ski areas, has seen a small increase in its upper slope base but a drop in cover depth on lower runs. 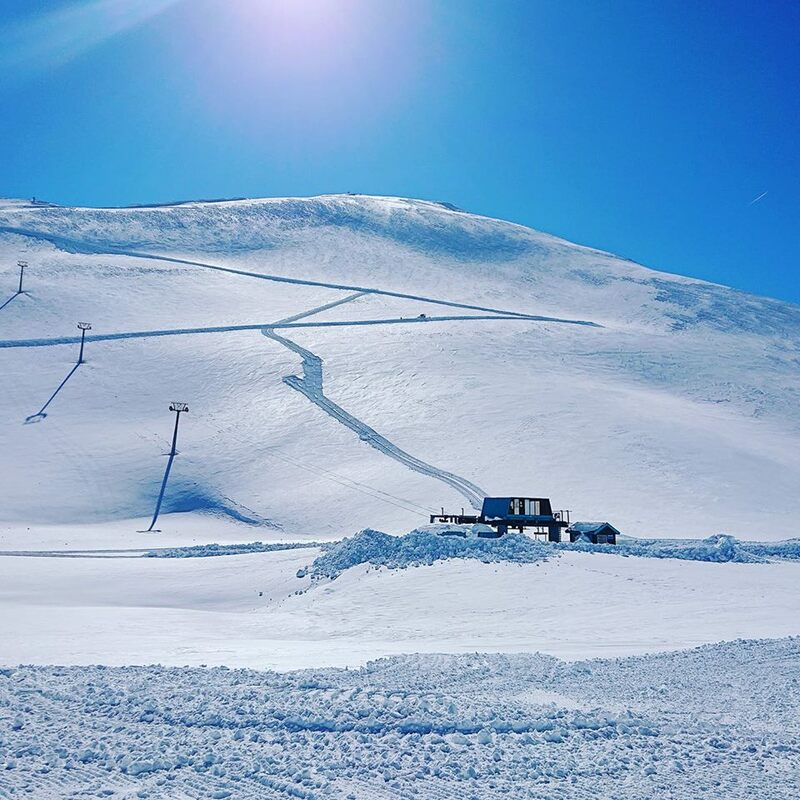 Norway’s three summer ski areas start opening for 2019 from this Sunday with Fonna glacier ski resort up first. Galdhøpiggen follows on May 9th then Stryn Sommerski on 29 May. Stryn just released a picture of how things are looking there today. Less fresh snow to report in Scandinavia over the past week but generally good conditions still with the snow staying nice and powdery in the north thanks to temperatures staying mostly sub-zero. Almost all Scandinavian ski areas are still open and a sizable proportion will make it to the last weekend of April or first weekend of May. There’s been more snow reported on the Swedish side with most areas receiving 5-10cm of new cover there. Riksgransen, open to June, has the deepest base in the region at 3..6m although that’s dropped 40cm on a week ago. The summer skiing destination: Fonna glacier is due to open this weekend. Most of Germany’s ski areas have now closed for the season although some of the larger resorts are still operating. The country’s highest slopes on the Zugspitze Glacier (0/420cm) just keep getting more and more snowfall, with another 20cm reported in 24 hours to start this week on a high. The season there continues right through to the start of May when it will be the last area in Germany to close. Most of Bulgaria’s ski areas are now closed for the season but it has kept snowing, on and off, on higher slopes. Bansko (5/110cm) is still operating though and the resort’s slopes are more-or-less fully open with more than a metre of snow lying on upper runs, although lower slope cover is down to a few centimetres. Glenshee (0/0cm) and Cairngorm (20/50cm) were both closed for lack of snow a week ago after the latest British thaw but a drop in temperatures and heavy snowfall allowed Cairngorm to re-open more than a dozen runs at the weekend. This is good timing for the start of the Scottish schools Easter holidays. The Lecht (5/30cm) also got a complete fresh snow covering having previously just had the beginner area open (thanks to all-weather Snow Factory machine-made snow). Over on the west, Glencoe (10/40cm) and Nevis Range (10/40cm) had both survived the thaw and were open in any case but conditions improved with fresh snow there too. A still mixed picture in Japan after the mostly dry March with some ski areas seeing significant snowfalls for the start of April with others remaining dry with just a few centimetres of fresh since last week. Nozawa Onsen (230/305cm), one of the Japanese resorts due to keep some terrain open until May, reported 30cm of fresh and posted some deep powder skiing pics. There are now only the Yamabiko and Uenotaira sectors still open there with the lower Hikage, Nagasaka and Karasawa sectors now closed. Niseko (80/330cm) also saw some sectors closed at the weekend although, again, most will remain open to May. It has been a mostly dry week there with just a few morning dustings of fresh snow. US resorts are ending their seasons thick and fast now with big names like Jackson Hole among the latest to call it a day on the 18-19 ski season; ending theirs on Sunday. But on the other hand, it does keep snowing, especially in the west, if not with the huge falls we saw in February and March. Mt Baker (295/391cm), in Washington State, famous for getting the most snow on average of any ski area in the world each season (although that probably won’t be the case this season) posted one of the biggest snowfalls of the week with 39cm in 72 hours over the weekend. Squaw Valley (211/599cm), in California, to the south clocked up 30cm of fresh snow to help maintain its current position of having the deepest snow in North America and the third deepest in the world. That’s good news for its plan to stay open to July 7th. Some fresh snow across Canada over the past week with some of the biggest falls for the start of the week in Quebec where Mont Tremblant (588/588cm) is now not just claiming the deepest base in the country but is up there among the deepest in North America; alongside the snowiest over in California on the US west. It has been snowing in Alberta and BC too. Big White (188/188cm) and Whistler (226/226cm) both reported some nice 10-200cm 24-hour snowfall totals over the weekend although a forecast big dump on the Pacific Northwest did not quite live up to some of the more optimistic (metre plus) forecasts. 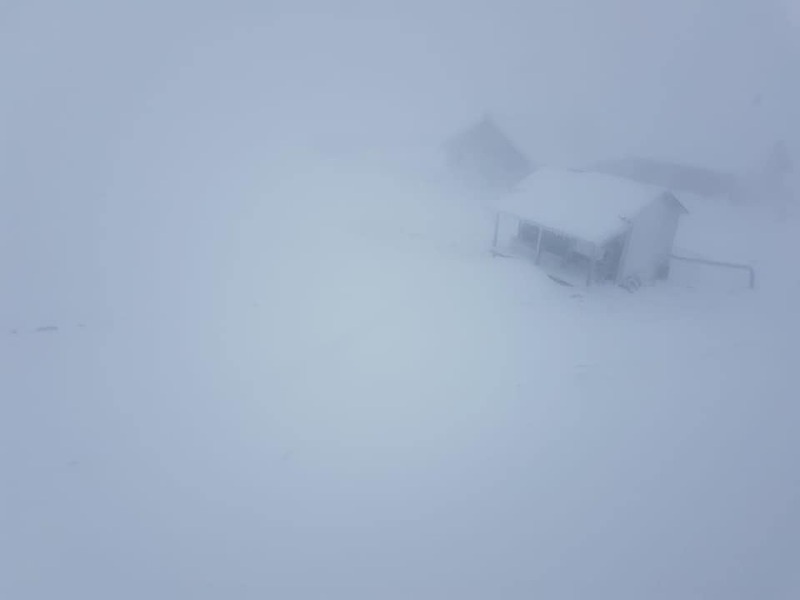 There’s a bit of a blizzard blowing at Europe’s most westerly ski area: Portugal’s Serra da Estrela. Should be great Easter powder skiing once the weather improves. It may be approaching mid-April and resorts may increasingly be closing down at the end of their season but there’s no real end in sight to the current fairly changeable and sometimes very wintery conditions. The forecasts for the coming week, in terms of how much snow is likely to fall, is very varied with some areas likely to only see 10-20cm whilst others in the same country may get up towards a metre again. Altitude is one big factor though with the heaviest snow likely up above 3000 metres and valley floors and lower slopes may well get rain. So the heaviest snow (potentially another 60-90cm by the end of the week) is forecast for Alone glaciers and higher slopes in regions like the Austrian Arlberg and the French Haute Tarentaise. The Dolomites, too, look to be heading for a repeat of the huge snowfalls there at the end of last week. Similar (potentially 1m+) snowfalls are forecast for the latter half of this week too, after a few days of lighter snowfall to start the week. It has been snowing on and off for nearly a fortnight now in the Pyrenees and that looks set to be the picture for the week ahead too, with more snow expected. Some of the heaviest falls could potentially add up to as much as 50cm more on higher slopes on the French side of the range by Friday. For Scotland there’s no huge change on the way according to current forecasts. Some light snowfalls are possible and hopefully temperatures will be low enough for existing conditions to be maintained. It’s not just the Alps that are likely to see snowfall. The white stuff should keep falling in western North America too. Ski areas in states like California and Colorado should see 20-40cm of more snowfall. North of the border, Whistler Blackcomb is in line for another 35cm of snow. Rather ironically, the biggest accumulation is forecast for Jackson Hole which has already closed. It should get more than 60cm (2ft) more snowfall this week.